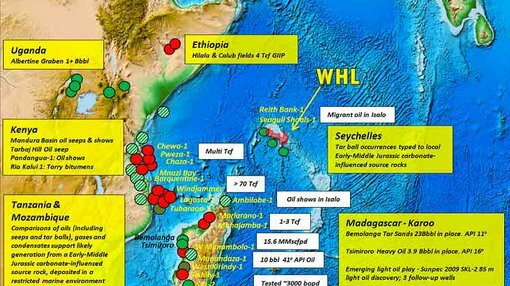 WHL Energy’s (ASX: WHN) Seychelles oil project is accelerating the company’s farm-in agreement with a $3BN partner has been signed off by the island chain’s government. The final hurdle for the deal was to attain the support of the Seychelles government which has been working for decades to exploit the area’s abundant and largely untapped resources. WHN’s deal with Ophir was formally inked by the Republic’s Vice President Danny Faure at a special signing ceremony in the capital Victoria. In addition to approving the farm-in deal, Seychelles also agreed to extend WHN’s exploration period to mid-2016. Since 2010, WHN has spent millions of dollars exploring its holdings in the Seychelles and has developed ten 200M barrel targets – a total of 2BN potential barrels of oil – in areas known as Beau Vallon and Junon. These target figures are based on a 2D seismic survey’s and historic information. Now that the JV deal with Ophir has been approved by the Seychelles government, the next step is for a 3D seismic survey to be undertaken across the exploration targets. A bidding process for that work is underway.